Can Collectors Call About Debts Not On My Credit Report? Can Collectors Call About Debts Not On Your Credit Report? After a call from a debt collector, you may check your credit report to make sure the collector is telling the truth about what they allege you owe. If the debt isn’t on your credit report, however, it raises some questions as to whether the debt collector can legally collect from you or if the debt is even yours. Just because a debt isn't on your credit report doesn't mean it's not legitimate. A debt may not show up on your credit report for any of these reasons. The Debt Is Beyond the Credit Reporting Time Limit: Most debts can be listed on your credit report for seven years. After that, credit bureaus can no longer report the debt. The Debt Is Beyond the Statute of Limitations: Don’t confuse the credit reporting time limit with the statute of limitations on debt, which is the period of time that a debt is legally enforceable. The two aren’t related, except with court judgments in states where the statute of limitations for a judgment is longer than the credit reporting time limit. The Debt Collector Hasn’t Reported It Yet: It’s possible that the debt collector intends to list the account on your credit report, but is perhaps giving you a chance to pay the debt first. Some accounts go to “pre-collections” when they’re only one or two months past due. 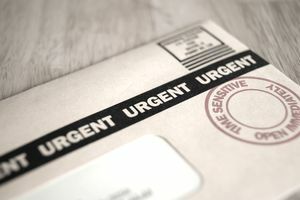 During this period, you may get calls or letters about the debt even though it’s not on your credit report yet. The Debt Is on Another Credit Report: You have credit reports with three major credit bureaus – Equifax, Experian, and TransUnion. If you’ve only checked for the debt on one of your credit reports, it’s possible that the debt appears on another. The Debt Collector Doesn’t Report to Credit Bureaus: Another possibility is that the debt collector doesn’t subscribe to any of the credit bureau services. Debt collectors are required to report debts accurately when they decide to report to credit bureaus, but credit reporting is voluntary. The Debt Isn’t Yours: Some “debt collectors” run a scam convincing consumers to pay for debts that don’t belong to them or that don’t exist. The scammers are hoping you’ll pay without truly questioning the legitimacy of the debt. To confirm whether a debt is really yours, you can request validation of the debt within the first 30 days of the debt collector's initial contact. After receiving your request, the debt collector has to send you proof of the debt. The collector also cannot continue collection efforts on the debt until it has sent you proof of the debt. If the collector sends you satisfactory proof that the debt actually does belong to you, you can decide whether you want to pay. Paying a debt that’s past the credit reporting time limit doesn’t benefit your credit rating, but it does get the debt collectors off your back. For debts that appear on just one credit report, you may offer a pay for delete to remove the debt from that credit report. Or, if the account is in pre-collections, paying the debt will keep it from appearing on your credit report. If you choose not to pay the debt, be aware that the collector can continue to pursue you for the debt indefinitely – that means calling, sending letters, or suing you for debts still in the statute of limitations – even if it’s not on your credit report. You can stop debt collector calls by sending a written cease and desist letter asking them to stop calling you.